Policy target: All new construction must be certified LEED Silver or higher and exceed Title 24 Requirements by 20%. The UC System has adopted LEED, or Leadership in Energy & Environmental Design as the standard for Green Building policies. LEED is a program that provides third-party verification of green buildings. Building projects satisfy prerequisites and earn points to achieve different levels of certification. Prerequisites and credits differ for each rating system, and teams choose the best fit for the project. Learn more from USGBC about LEED, the facts, and the LEED rating systems. 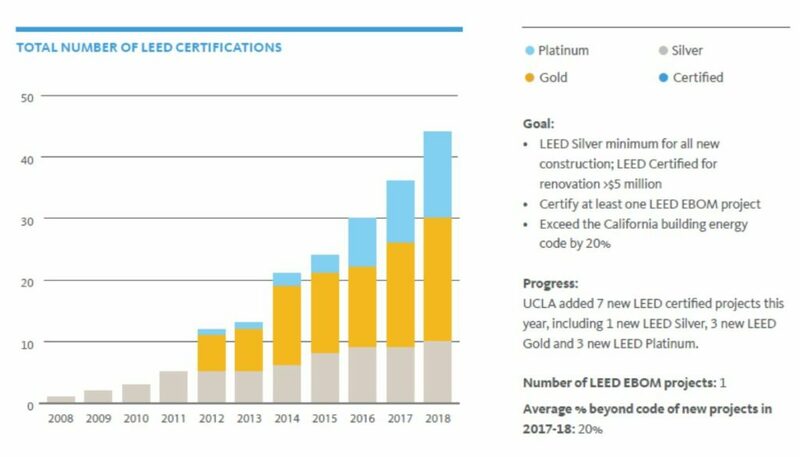 As of January 2017, UCLA has 45 LEED buildings and renovations completed on campus- 10 Silver, 20 Gold, and 15 Platinum. Additionally, two project received equivalent certification from UC; one at Gold Level and one at Platinum. In addition to these completed projects, UCLA has another 16 projects registered with GBCI. Click here for a complete building and project list.